"An organ is just a pretty piece of furniture unless it is being played!" The Bone Doctor, President of the Walnut Hill Organ Club. This website was created on 04/06/2004. The site was last updated on 09/13/2010. Welcome to Walnut Hill Productions. Located in Keavy, Kentucky, this house known as McKiddy Manor is the home of Living Room Productions. Staying on as a house guest is the Bone Doctor with some of his instruments and computers in tow. Also to be found here are the imfamous Sub Urban Cowboys, a unique virtual studio rhythm section along with the Walnut Hill Orchestra, a virtual gathering of over one hundred musicians who play everything imaginable. installed at Roaring 20's Pizza and Pipes in Ellenton, Florida. The main musical focus at Walnut Hill Productions, however, is the King of Instuments, the Mighty Theatre Pipe Organ, along with its virtual counterparts, MidiTzer, jOrgan and Hauptwerk. We specialize in digital on-site recording and post editing/mastering as well. 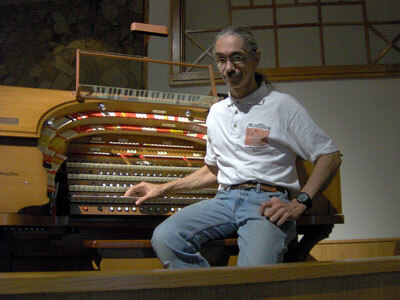 The photograph below depicts the 3/17 Mighty Conn Model 650 analogue Electronic Theatre Organ which was in use at Walnut Hill Productions during my stay in Ridgecrest, California from February 2007 to December 2008. Built in 1967, it has three manuals and seventeen ranks. Capable of realisticly modelling an actual Theatre Pipe Organ, it has a litergical Church Pipe Organ side as well, since it shares a common heritage with its classical sister, the Model 820 Artist Church Organ. This grand instrument was our fourth studio organ installation. You can learn more about it by clicking here. 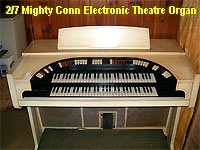 The 3/17 Mighty Conn 650 Theatre Organ console keydesk. In the past, Walnut Hill has had access to three other exceptionally fine theatre organs during our earlier local in-house recording sessions conducted between 2003 through 2005 while in Tennessee and Florida, pictured below. Click on a thumbnail to learn more about each instrument. The year of 2006 was spent playing many real theatre pipe organs and moving west to California, which saw the loss of the Conn 640 Analogue Elcectronic Theatre Organ due to shipping expense and time constraints. Its current whereabouts are unknown. When we move the company to Sweden in 2009, the Mighty Conn 650 will either have to be container shipped or we will have to replace it with something else. There will be organs to play there, and Doc's wonderful lady and wife to be, Erika Laur, has expressed great interest in having an organ in their home. Her preference is to have the Mighty Conn shipped over and the expense will be enormous, possibly prohibitive. But, we can always build a VTPO with today's technology. Also, the Skandia WurliTzer will be available, as well as the mighty VTPO that Per Olef Schultz has built from his vintage Rodgers instrument. 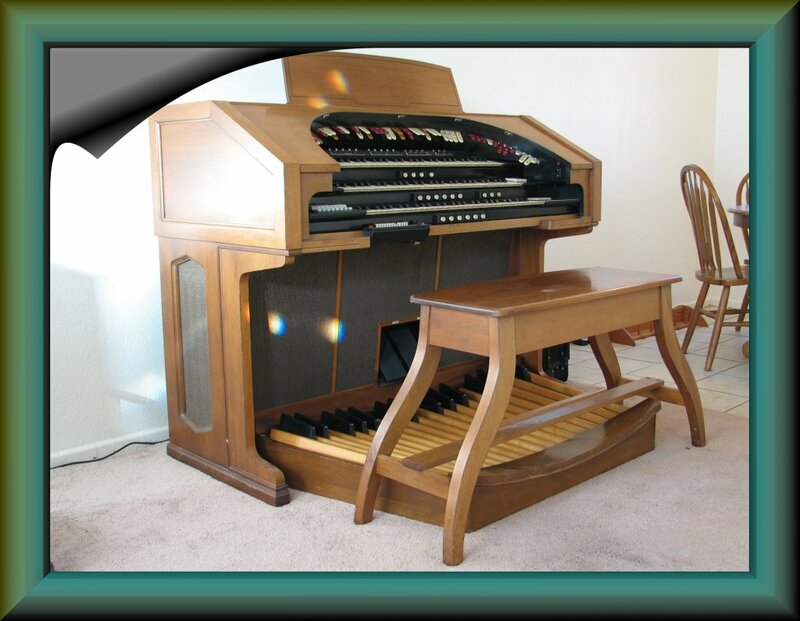 Below is an artist's rendition of the originally proposed console for the Virtual 4/36 Mighty WurliTzer Theatre Pipe Organ that was planned for the Walnut Hill Recording Studio of the future. The design was taken from a drawing of the Grenada 4/36 Mighty WurliTzer Theatre Pipe Organ in Califiornia. The source picture was monochromatic. Walnut Hill's Founding Father, Fred Willis, colorized and enhanced the graphic in Adobe PhotoShop CS to get this picture of what was to be a fantastic machine when completed. 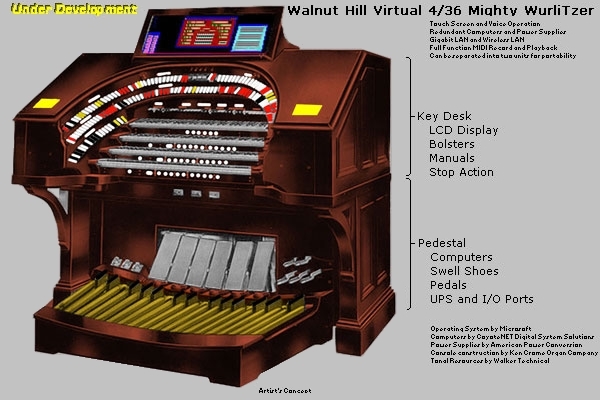 The proposed Walnut Hill 4/36 Mighty WurliTzer console. 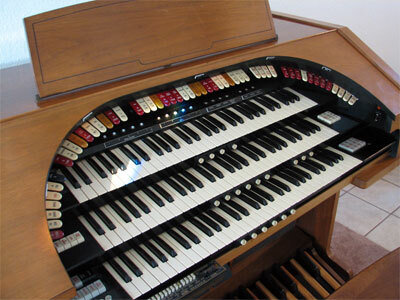 The console was to have been built by the highly renowned Crome Organ Company of Reno, Nevada from a design simular to the Grenada instrument, right down to the swell position indicators in the top rail of the Stop Bolster. The wood finish was to be finished in semi-gloss dark walnut wood. At that time, we were thinking big. However, things have changed in recent times, as we have relocated twice, first to Florida and now to California, and will soon be relocating again to Sweden. Today, the planned Walnut Hill Mighty WurliTzer will be a rather radical design that is built around a portable system that bears little if any resemblance to an actual Theatre Pipe Organ. 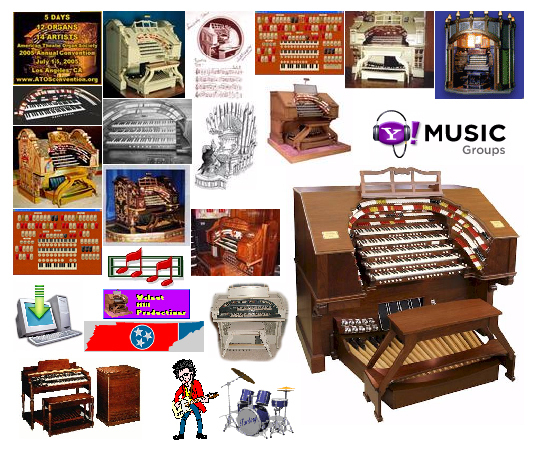 We will be using a compact but very powerful custom-built multi-processor WinTel workstation that plays back actual WurliTzer, Barton and Robert Morton samples available at Allman Music of Saint Petersberg, Florida. 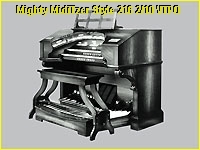 The virtual organ will be using a program from TASCAM known as Gigastudio Orchestra 3 under the control of the Mighty Miditzer 260 as the relay for the first design. Later, we will be moving to a program called jOrgan to get a larger instrument relay beyond three manuals and nineteen ranks, eventually reaching the originally planned 4/36 specification. This highly specialized computer running Microsoft Windows XP Professional 64-Bit Edition will be made by CoyoteNET Digital System Solutions, the designers and administrators of this website. It will be based on Intel Wolfdale-Hartsfield Xeon technology using two 3GHz CPU's on a Tyan Tempest 5400PW motherboard with 16GB of ECC RAM and multiple terabytes of RAID storage. The case will be rackmountable and placed in a flight-ready rack on casters with the audio interface and uninterruptable power supply. The wide-screen LCD monitor will sit where the music rack would normally be, and it will be touch sensitive for stop control. The goal is to build a machine that can be taken places. This means everything has to be portable. Thus, the keydesk will sit on a folding table and the pedalboard will simply slide underneath. The speakers will be contained in two swell boxes with actual shades. These will be just smaller than a refrigerator each, and on heavy duty locking casters. Each speaker will be self powered, so there will be no need for external power amp racks. Since all mixing of signals will be done in the computer, there will be no need for an external mixing desk. This will simplify the setup and make it much easier to transport. Once I am settled in a residence that is more permanent later on in life, the dream of the beautiful dark walnut wood WurliTzer four-manual Empire style console may once again come into play. After all, there is nothing like sitting down to a moving combination action horseshoe console that looks, acts and feels like the real thing. Technology may change drasticly before that happens, but the design of the Mighty WurliTzer Theatre Pipe Organ was perfected long ago. here at Walnut Hill Productions. Navigating around our website is easy. Just click on any one of the eighteen coloured stop tongues in the table at the top of each page to get to the various main website sections. You can also click the spinning yellow arrows at the top and bottom of each page to flip through the pages of the site as you would a book. 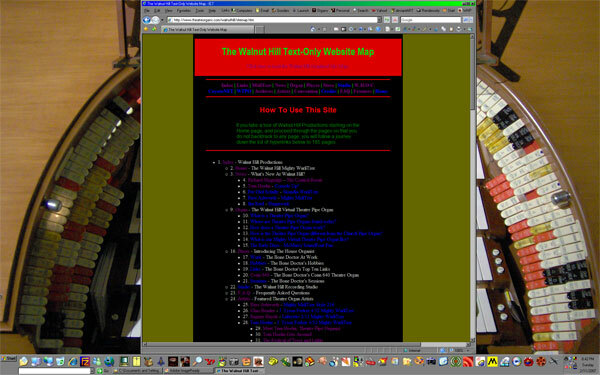 Click here for a Tutorial Screenshot. Also, the large banners at the top of each page are live, taking you to the root page for that section. This is a new feature we are implementing, so not all banners are hot-linked yet. If a hand cursor appears when you hover your mouse over the banner, it is hotlinked. Finally, if you click on the blue Website Map button between the spinning yellow arrows, this will load the graphical website map which will quickly get you to any of the 238 pages on our site. This is available in a text only version as well. Every graphic appearing on each page of the site has a tool tip that pops up as you hover over with your mouse, that tells you what it links to or offers more information about the graphic. Most of the graphics are hot links to other places or larger pictures. Throughout the body of the text, you will find many embedded hyperlinks which will take you to some highly interesting places in the world of the Mighty Theatre Pipe Organ. Be sure to visit them all. Our website is hand coded using Notepad in Microsoft Windows Server 2003 Enterprise Edition SP2. The work is WSYWIG validated by viewing it live in Microsoft Internet Explorer 7 during the editing. We do this so that the HTML code is lean and mean with fast, predictable results in any browser loaded on any machine running any operating system. We believe in fast page loads across platforms for maximum visability in cyberspace. To avoid all possible pop-ups and multiple instances of your browser loading and running, these embedded hyperlinks and hotlinked resources are coded to simply open in the same browser window that you are in right now. There are no hidden tricks. To quickly return to this site or even to this page, just hit your backspace key until you see the page you started from load. It really is that easy. Tune in with us at YouTube to watch videos of folks playing Theatre Pipe Organs. 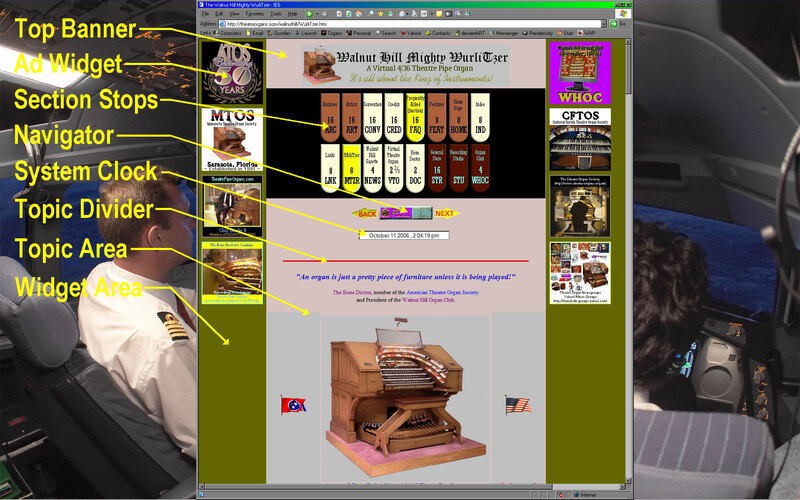 Visit the Slow Dog's Place at dA an art site for pictures of Theatre Pipe Organs. Tune in to WTPO Radio and listen to endless TPO Music from many great lesser known artists. Read the latest issue of the Gazette and rummage through the Archives. Learn about us and what we do here at Walnut Hill Productions. Check out our Featured Artists a growing list of wonderful musicians. 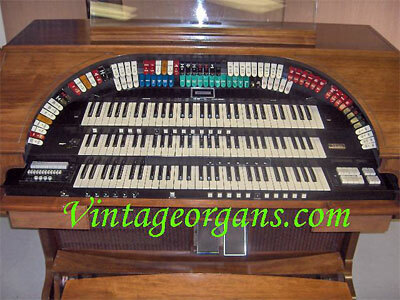 See some really neat instruments in the Featured Organs section. Listen to lots of free CD quality music by our studio players. Listen to some selections from the Mighty MidiTzer played by The Bone Doctor. 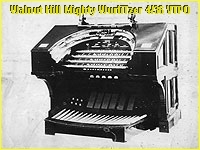 Listen to the early recordings of the Walnut Hill Virtual 4/36 Mighty WurliTzer. Listen to the Bone Doctor playing famous Theatre Pipe Organs in Florida and Ohio. Visit the Walnut Hill General Store for organ merchandise and free PC desktop goodies. 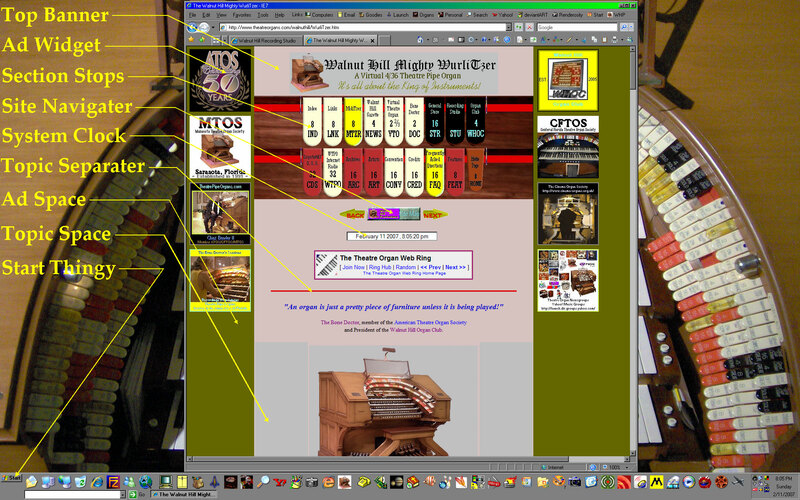 Visit our Links Page for many other top notch Theatre Pipe Organ websites. Get answers to your questions about Virtual Theatre Pipe Organs. Learn how things work. Visit the Walnut Hill Wall of Fame and get to know its many members. See what happened during the 50th Annual ATOS Convention of 2005 held in Pasadena. Learn about the Walnut Hill Organ Club. Join this growing group if TPO enthusiasts. Feel free to roam around our website. Learn about and see the King of Instruments up close. Listen to hours of beautiful music. Visit hundreds of interesting places. You can spend a lot of time here, even with a high-speed connection. Although we have tried to keep the size of our website graphics small, some still take a bit to download because we do not compromise on image quality. Many of our pages are quite large. Please be patient as each page loads. The same is true for our audio and video media files, which have broadcast quality video and stereo audio in 128KB/sec WMA fornat for fast streaming and CD/DVD quality playback. Yes, ours is a website that has much to offer indeed, and it is growing every day. We strive for excellence. It is an honor to serve you. Thank you for visiting. 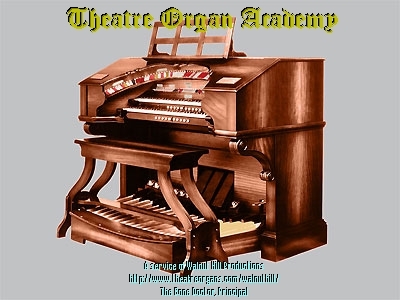 Enroll in the Theatre Organ Academy! 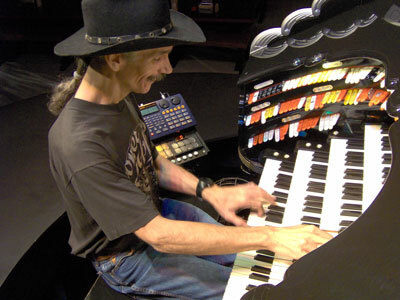 We are now enrolling students in the Theatre Organ Academy on Yahoo! Music Groups. Here, you can learn how to play the King of Instruments from some of the best minds in the field. All levels of expertise are welcome, from the beginner to the professional artist. Enjoy your visit to Walnut Hill. Thanks for stopping by our little corner of cyberspace. Enjoy your stay with us and come back often, for it is an honor and a priviledge to have you here. The site is a work in progress. Thus, it is changing all the time as we add new content. We shall be expanding and improving our site in the days ahead. The best is yet to come. God bless all who visit us and happy playing! Your one stop for all things Theatre Organ! Get A Free Website For Your Instrument! Our Hosts at The Theatre Organ Home Page are now offering you the opportunity to place your very own Theatre Organ website on their server. This is great news for local ATOS chapters and other organizations as well, including schools, restaurants and individuals. Getting your site online is easy and free. To find out how to make this happen, enail the Theatreorgans.com webmaster, Jerrell Kautz, VintageOrgans.com. Get Free Microsoft Internet Tools. Get Microsoft Internet Explorer 6 SP1. at a desktop resolution of 1024x768 in true color. of all your multimedia files. Copyright ©2007 Richard Mogridge, Walnut Hill Productions. All rights reserved. Trademarks used herein are the property of their companies. Become a part of our team here at the Walnut Hill Productions website. We are now accepting file submissions to be featured including photo's and music. E-mail The Bone Doctor for more details on how to get started. We would be glad to have you onboard.